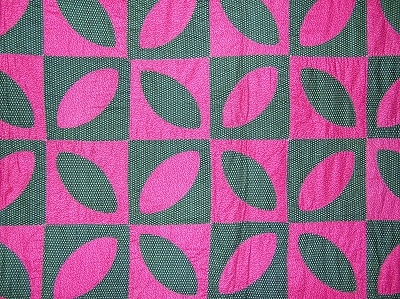 Antique 1900s Orange Peel Quilt - Graphic Pink and Green! Quilt13-101 - Antique 1900s Orange Peel Quilt - Graphic Pink and Green! Antique 1900s quilt measuring 81 inches by 84 inches. Pattern is an Orange Peel or Lafayette block. There are 121 blocks, set straight, measuring 7 inches by 7 inches. Alternating color placement of the double pink and double green fabrics. It is hand pieced and hand appliqued and hand quilted at a primitive 5 spi to the piece and in double lines. There is a 1.75 inch pieced sawtooth border. The batting is a thin cotton. The edges are finished by the front being brought to the back and stitched by hand. Backing fabric is a tan cotton print. The back was brought to the front to finish the edges, and applied by hand. The backing is a white cotton solid fabric, and the batting is thin cotton. Condition is very good, no holes, wear, or odors. There are 2 small spots, and an area of fading. Please click on the Image Gallery for additional pictures.